9 tracks: Meantime * Slade House * Minsteracres * King’s * Port na bPúcai * Cronin’s: Wasted Day * Wild Geese * Southall * Clancy’s. Matt Tighe was born in South London, with a London and Trinidadian background. He first discovered his love of traditional music and the fiddle listening to his parents’ album collection: The Chieftains and Tom McConville & Pauline Cato in particular made a lasting impression. After attending Cambridge Folk Festival and listening to traditional music live, he decided to learn the fiddle in earnest. Eight years on he is an active member of the folk scene in the UK, playing at festivals, clubs and in sessions on a regular basis. Matt has been a finalist in the Danny Kyle Open Stage at Celtic Connections and a semi-finalist in the BBC Radio 2 Young Folk Awards. 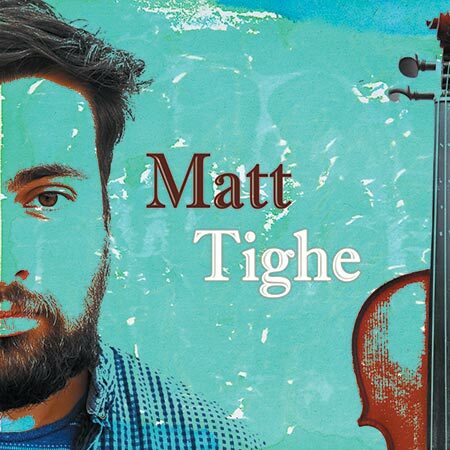 Matt’s style of fiddle playing is greatly influenced by the music of County Clare and his teachers Dermot Crehan and Brendan Mulcaire, as well as the Scottish music gathered at Cambridge Folk Festival and on visits to Glasgow. He is currently studying Classical Performance with John Crawford at Trinity Laban Conservatoire of Music and Dance in London. This is a stunning album by a hugely talented fiddler, blending well with his invited session musicians. Brian McNeill described the final mixes as “brilliant” and coming from someone of his calibre, that is some recommendation. In recording his debut album at Watercolour Studios in Ardgour, Matt was accompanied by some outstanding session musicians, including Tad Sargent (bouzouki, guitar, mandocello, bodhran, piano and harmonium), Chris O’Malley (piano and harmonium), James Lindsay (double bass), Luke Daniels (melodeon) and Brian McNeill (concertina) who also produced the album. Recorded and mastered by Nick Turner. Sleeve Design is by Penny James.